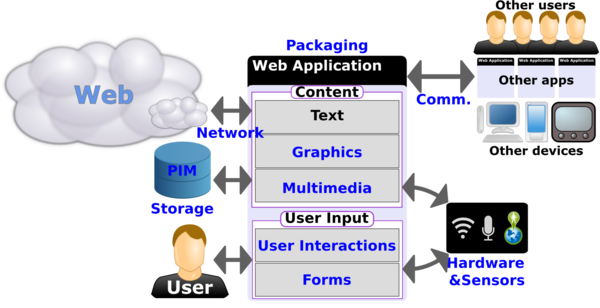 For Web apps outside of the browser, a purely programmatic approach is part of the System Applications Working Group, with work on a Contacts Manager API in progress. A more global access to sensors and hardware (including USB and bluetooth) is in scope for the System Applications Working Group. A Web Bluetooth Community Group was started to develop a Bluetooth API for browsers with a particular goal of supporting Bluetooth Low Energy devices. XMLHttpRequest (the basis for Ajax development) is a widely deployed API to load content from Web servers using the HTTP and HTTPs protocol: the W3C specification (formerly known as XMLHttpRequest Level 2 ) completes the existing deployed API with the ability to make requests on servers in a different domain, programmatic feedback on the progress of the network operations, and more efficient handling of binary content. The WHATWG fetch API provides a more powerful Promise-based alternative. The Task Scheduler API makes it possible to trigger a task at a specified time via the Web app service worker. In March 2014, W3C organized a workshop on Web payments to identify ways in which standards could help make that payment experience much simpler, in particular on mobile devices. In Octobober 2014, W3C chartered the Web Payment Interest Group to drive work in this space, and that group released its sense of priority use cases for Web payments which should lead to new standardization work in the upcoming few months. The Resource Hints specification let developers indicate what resources should be downloaded when the browser can afford it. Editing activity for Last updated April 2015 June 2014J 0 commits in June 2014 July 2014J 0 commits in July 2014 August 2014A 0 commits in August 2014 September 2014S 4 commits in September 2014 October 2014O 2 commits in October 2014 November 2014N 2 commits in November 2014 December 2014D 4 commits in December 2014 January 2015J 1 commits in January 2015 February 2015F 0 commits in February 2015 March 2015M 1 commits in March 2015 April 2015A 19 commits in April 2015 May 2015M 0 commits in May 2015 2014 2015 Commits on ed. draft None?